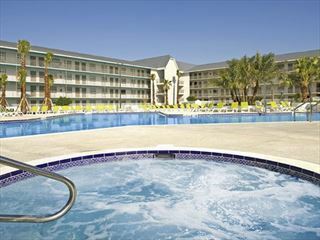 (Formerly the Quality Inn Plaza). Located opposite the Pointe Orlando complex with great shops and 21 cinema screens, there is also a free shuttle service to take you to the best attractions on International Drive. Each bedroom has a fridge and microwave, and best of all for families there is a Kids Eat Free programme and discounts for Seniors. 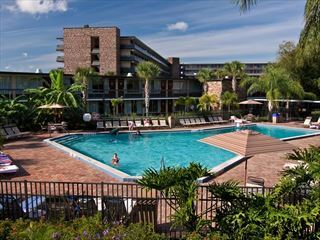 And finally, there are three swimming pools to cool off in when you’ve had your fill of Orlando’s attractions. Top Tip: You’ll need to book your place early the day before on the hotel’s shuttle to Universal Studios and SeaWorld, but it’s complimentary so worth planning ahead. 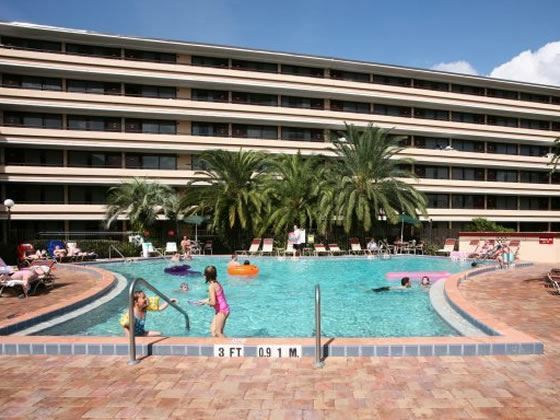 Located opposite the Pointe Orlando complex with great shops and 21 cinema screens and a short drive from SeaWorld Orlando, Aquatica, Universal Orlando Resort, Volcano Bay and Walt Disney World Resort. 1,020 rooms in four buildings. Rooms have either two double beds or one king size bed,sleeping 4 people or 5 with a rollaway bed (Roll away beds are available for a supplement of approx $15 (plus tax) per day payable locally). Plaza Garden Restaurant - Serves daily buffet breakfast from 6.30 - 10.30am and buffet dinner from 5 - 9pm, Kids eat free programme. Lite Bite Mini-Market & Deli - 24-hours offering a variety of sandwiches, salads, snacks, and assorted beverages, to eat-in or take-out. Zebra’s Sports Bar & Grille - Open from 3pm until late, daily. Featuring nightly happy hour drink specials, a grille menu for dine-in or carry-out, and lively Karaoke nights. Smoooth Java Coffee Bar & Gifts - Features freshly brewed Starbucks coffee, delicious smoothies, and an assortment of fresh pastries. Open for breakfast at 6.30 and throughout the day. Prices correct as at 6pm on 20 Apr 2019. Please call for final price. Prices are per person based on 2 adults & 2 children sharing. Other durations available - call for quote. Prices include flight and accommodation as stated below. Great value transfers or car hire packages with Dollar rent-a-car are available, please ask your Florida travel expert for more information. For the purposes of the prices above, children are assumed aged 11 and under. Teen prices also available. Free I-RIDE Trolley Unlimited Ride Pass Book your stay on International Drive for 7 nts or more by 30 Apr and receive a FREE I-Ride Trolley 5-day Unlimited Ride Pass per person. Valid on stays throughout 2019/2020.